Check this out...3 posts in a row, which means 3 days in a row for your chance to win the entire Berrylicious collection over on the Imaginisce blog. Have you been following the daily party over there? If not, head on over and be sure to comment on each days posts to increase your chances of winning. I am switching it up a bit today from strawberries to the adorable lemon heads in this line. My reveal today is one of several cards I made with the new line. I just love these little lemon heads. 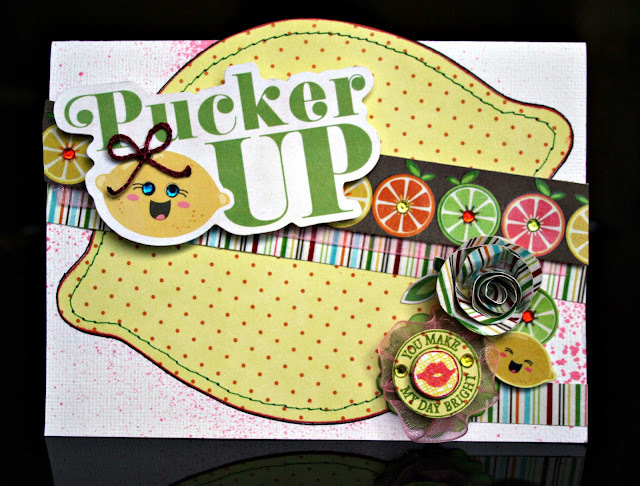 The moment I saw them and the "Pucker Up" die cut I just knew I needed to make a card. I think what I might do with this card is give it to a friend who is collecting items to send to her son's troop in Afganistan. I would love to gift this to a brave soldier to send to their someone special in hopes that just maybe I can put a smile on their face. To make the card, I hand drew the super sized lemon and then stitched on it prior to adhering to the card. I used the Imaginisce Roly Posy to make the striped flower. I also used a CTMH stamp to make the sentiment and glued ribbon around the sentiment to make it look like another flower. I couldn't resist adding a bow and blue eyes to the larger lemon. Lastly, I added bling to the citrus fruit to make them pop. Don't forget to swing by the Imaginisce blog for your chance to win you very own Berrylicious collection! Awesome! I like those embellishments flowers. Beautiful card!! the flower is fantastic! what an adorable card! i love the lemon! How cute! Love the misting and the stitching! Oh and the embellie cluster is fab!